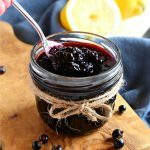 This Best Ever Black Currant Jam is made with only 3 simple ingredients and it's the perfect homemade jam for summer! Learn how to make jam with NO pectin in only 15 minutes! Add the black currants to a deep pot along with the sugar and lemon juice. Stir to combine and turn the heat to high, stirring every now and then until the mixture starts to bubble and become hot. Use a potato masher to mash the currants until they begin to fall apart. When the mixture begins to boil, continue to stir every 30 seconds or so. Use an instant-read thermometer - here's a link to mine (affiliate link) - to measure the temperature of the jam as it boils. Be sure the thermometer is measuring at the middle of the jam and not touching the bottom of the pot. Continue boiling as the temperature climbs and don't let it stop boiling until it reaches 220 degrees Fahrenheit (for low altitudes) or 218 degrees Fahrenheit (for high altitudes). This should take about 8 minutes or so. Once the correct temperature is reached, remove the pot from the heat and carefully spoon the jam into 2 mason jars. The jam might seem a little bit liquid at this stage - don't worry! It will thicken as it cools. Add the lids to the jars and allow to cool at room temperature until completely cool. Use the proper water-bath canning process to create a shelf stable version of this recipe, if desired. The recipe, as it is, is a refrigerator jam.